Tasmanian Farr 40 Voodoo Chile made a clean sweep of day two at the Aberdeen Asset Management Farr 40 Queensland State Titles, holding the fancied Sydney crews at bay and edging closer to an overall victory. Today’s three bullets in the building NNE – NE 7-12 knot breeze means Voodoo Chile is a commanding six points clear of the nearest threat, a near impossible target for the chasing pack. The temperature might be substantially higher but to the hardy Hobartians the flat seas and shifty conditions on Queensland’s Moreton Bay feel like home. “A mild chop and lots of wind shifts are the conditions we sail in on the Derwent in Hobart,” said leading skipper Andrew Hunn this evening, Saturday 26th October. 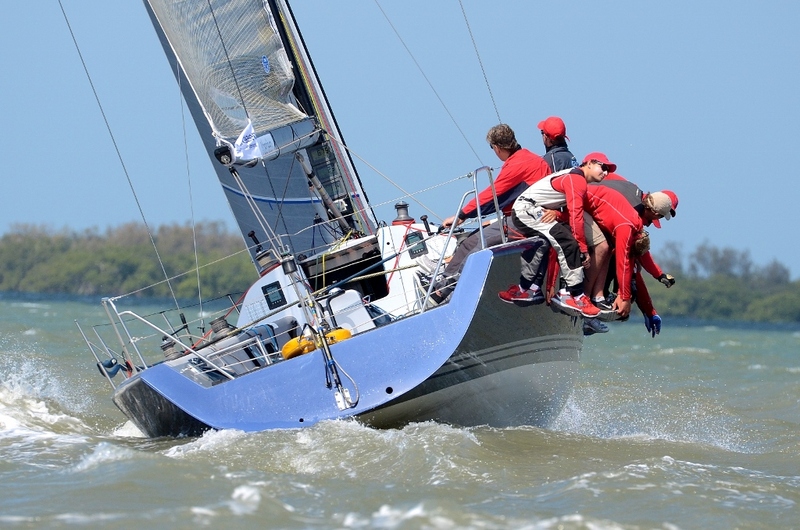 Guido Belgiorno-Nettis’ Transfusion from Middle Harbour Yacht Club in Sydney is holding onto second by three points from Lang Walker’s Kokomo. Olympic gold medallist Malcolm Page, tactician on board Kokomo said, “The Tasmanians had a clean slate today; they are very slippery”. He did remind that Hunn and his crew are campaigning Lang Walker’s second Farr 40, “I think the charter fee might be going up,” he laughed. “After an eight month break following the nationals last summer, this regatta is a familiarisation for us. Today’s two seconds were better than yesterday. Even the boss said ‘you realise how much training does for you’”, added Page. There have been a couple of crew changes on Kokomo (CYCA), fifteen year-old 420 sailor Finn Gilbert following Page from the SB20 class to his first experience with the Farr 40s. Dad Lachlan’s only instruction was not to spoil the youngster and the crew has followed orders. Finn’s role on the boat is on the kicker and in the ‘sewer’, pulling the enormous kite back into the boat. “We’ve got big hands downstairs in Finn,” said Page. The small but quality fleet tried a new format today to mix things up, a middle gate for starts and to compress the one-design owner driven 40-footers on the upwind and downwind legs. International Race Officer Louise Davis said the trial went smoothly, “Having a gate in the middle of the course squeezed the fleet and forced them in a direction they might not have gone, and it looked spectacular”. Aberdeen Asset Management’s managing director Brett Jollie was on the course area outside Green Island watching the day’s events unfold. With their impressive scoresheet and the extra competition credits the Transfusion crew banked at the Rolex Farr 40 World Championship at Newport Rhode Island in August, Jollie thought the outcome for the current national champion at this state title a lay down misère. “It’s great to see Voodoo Chile pick up where they left off at the nationals, and pushing the Sydney boats. It adds another element,” Jollie said. Voodoo Chile finished third overall at the last John Calvert-Jones Trophy Nationals in Sydney and first Corinthian boat. On the upcoming season Jollie added, “We are excited to be back as principle sponsor and we are looking forward to another big series”. Tomorrow, Sunday 27th October he will host 50 guests on behalf of Aberdeen Asset Management and in the afternoon he’ll present trophies to the placegetters at the Royal Queensland Yacht Squadron, event host and home of local Farr 40s John Leman’s Bobby’s Girl and David and Howard Lambourne’s Lambourdini.